There are also 1 guests viewing too. Replies: 127 (Who? ), Viewed: 222163 times. Some times, when playing, you see a sim that "jumps" (interrupting his current interaction), or a pet that suddenly "sinks into the floor"; this means that an error occurred in the game, and the game reacted stopping the interaction and resetting the sim/pet, or the offending object. In other cases, when entering a lot, the loading time is endless, and the game seems stuck; this happens because there is an object that causes an error when created: the game resets it automatically, and the object causes again the same error, in an endless loop. The causes for the jump/sink bug and endless loadings may be very different, and usually are related to a custom object or hack that doesn't work correctly. In these cases, the first thing to know is *which* object is causing the problem; and determine *what* problem is actually occurring. A valuable help to track down the bug is the error log. You can read yourself the log, or you can send it to the creator of an object that you suspect being the culprit of the jump/sink effect, or the endless loading. Preliminarily, download the file "Behaviour.zip" attached to this post and unpack it to: (Documents)\EA Games\The Sims 2\Config (please note that it's NOT the Downloads, it's the Config folder). This step is absolutely optional, but it will help me a lot with your error logs. The zip contains a small file that will not interfere in any way with your game, but makes the error logs much more readable. When done, procedd with the creation of the error logs performing the following steps. Before starting the game, go to (documents)/EA Games/Logs and delete all the files in the folder. Start the game and go to your neighborhood. Enter the lot where the sims jump or the pets sink into floor (or the lot that has an endless loading). If you know what interaction cause the jump bug, then order the sim to perform that interaction; otherwise, just play as usual, waiting for the bug to happen. Click "Reset"; if the window appears again, click "Delete". When there are no more error windows, close the game without saving. Open again the folder (documents)/EA Games/Logs: you will find several files in them, but the interesting ones are named "ObjectError_.....txt". If you have some modding skills, you can examine them by yourself (see "How to read an error log", below). Otherwise, send them to the creator of the object that most probably causes the bug. Always keep in mind that if the jump bug occurs using an object, it doesn't necessarily mean that the culprit of the bug is that object: but, at least, you have a trace to follow. The parts in bold are the most interesting for anyone; the parts in italics are interesting only if you have some skills in editing the BHAVs. Reading these two lines, you will know the name of the offending object; if you read the name of a sim, ignore it: it's just the sim that was performing the interaction when the "jump bug" occurred (i.e. the sim that jumped). The interesting part is the name of the object, in this case the fireplace. NOTE: if you read the names of two sims, this means that the error occurred when two sims were interacting with each other; these bugs are harder to track down. If you have some experience with BHAVs, these line will tell you when the error occurred: in this case, the error occurred when executing a BHAV from the FireplaceGlobals, in particular the BHAV with instance 0x200E (i.e. "8206" converted in hexadecimal). the error occurred at the first line (Node 0) of the said BHAV. You can now examined the BHAV pointed out in the error log, in order to understand why it causes an error. NOTE: the values following "Params:" and "Locals:" may help you better understanding the problem. Don't post error logs in this thread, unless requested to do so: the unrequested logs will likely be ignored. On the other hand, if you have some questions about other lines of the error log, not explained above, ask me and I will reply (if I know the answer ). yes-noDisplay a dialog with a message and yes button. lampengage and block simEngages the executing tree and pauses all other sims until the dialog is dismissed. return and block simReturns immediately, and pauses all sims until dialog is dismissed.beginStarts a situation with me as the situation object. Returns false if a situation could not be started. noneinitThe init tree is called whenever an object is reset. This happens when the object is first being placed, and if "Reset" is chosen after an object error. CanPassThroughObjectsSelectable(Shown in Skewer)Set this flag to get a Sim into the UI, and make them selectable. Day of MonthContinueSimulatingWhilePresentSimulator pauses when all people are gone, set this flag to keep it going. Anywhere nearCounts As FloorFlas field 3 is field 98 in object data. on top of meCreate object normally. I find that If I use the cheat 'Max Motives' my pet suddenly jumps up from under the floor. Its strange and has only happened around 3 or 4 times. Or if I reload the lot, it works again... but its a sure fire way to let pets starve. I am going to try your log method and see what is causing my problem! thank you! Visit designit botan the new site and new url! no really... its new new!!!! I always maximize motives by activating the testing cheats and then shift-clicking on the mailbox: there's an option for that "Make all happy"
Thanx Numenor. This is going to save me much time when I get around to getting those pets out of the floorboards. I have a problem with all my Sims and their pets in a certain household (I haven't tried any other houses yet) But the object errors are the Sims and Pets themselves. Is there anyway I can right this? I don't want to delete this family, its been a long line of genetics. I can't get the Sims to do anything. Pets and Sims *can* be the Stack Object, yes; this happens when the error occurs during (or due to) a social interaction. As usual, the first thing to try is to remove the entire Downloads folder (move it away, on the desktop) and run the game. If no errors occur, then you have some incompatible hack in your downloads. Is it safe to delete the error logs? I have one door that doesn't chime the way maxis wants it too and whenever I open the cheat window it gives me an error for it and a new log is created. I'd never find an error if I really neeeded too with all those logs in the folder. Then I must have 50 that are 0 bytes. Just empty. Also what is the locked bins for? I have something in it that says kissing points? And that's it. Only asked because I am cleaning everything up. Moved all my packaged lots, cleaned up downloads. Now I just need to figure out how to tell if I have lingering meshes. Anyway these are the two I didn't know what to do with. You can safely delete all the files into the "Logs" folder. The game will re-create the needed ones on the next run (the game always creates some logs every time it runs, and leaves them at zero-length if there is nothing to write in them). As for finding the most recent error logs, you can just sort the Logs folder by creation date. The locked bins contains the locked collars and skins for Pets; that name (kissing point) is not meaningful. Doh, jeez I know that. lol I don't know what I was thinking, just looking at that folder gave me another headache. It's brain damage from cleaning the download folder, what a mess. Okay thank you so much for all the info. I just didn't want to touch something I wasn't supposed to mess with. I'm not sure how many character files we can have in the game and I have a lot of Sims, someone said having too many character files will ruin the neighborhood. So trying to get rid of anything I don't need. I know their not character files, but I figure the less bogging the game down the better. At least till I can narrow down the Sims. Although my son thinks I'm nuts, he said jeez mom, just back up your downloads. It crashes, it crashes you have all the cd's you can just re-install. I've heard of a file limit only in the earlier versions of the game and only for Mac systems, not Windows; in any case, the old log files are not read nor loaded when the game runs: the game just ignores them. I have a problem with a lot loading EVERY TIME i play the game! Every lot i load has the same error! It is not a file, as i completely removed all CC and tried again. It has come to the point where i can't play without testing cheats(not that i mind as i test stuff all the time anyway), but it becomes a pain, and the error logs from it are starting to take up more spav]=ce on my computer than anything else! Should i post the error log here? I have no clue what is causing the problem. Life is not measured by how many breaths you take, it is measured by the moments that take our breath away. You can safely delete all the files in the "Logs" folder any time you want. Yes, post an error log here, I'm curious But first, remove all the custom content and delete all the files in the Logs folder; then start the game, activate the cheats and enter a lot. When the error messages pop up, take a look at them, just to understand if they are all the same error, or not (in this case, post here 2 or 3 logs related to differeent errors). I don't know what it was, but this time when i removed all CC the errors havn't appeared. Sometimes they will and other times they won't. Now i'll try with the CC and see if you can help me find the problem file. I'll start it and get the error logs now. Edit:Oh and i almost forgot, The log was created when CC was added and enabled. Here's one of the logs. KMN - You are partly right, but you comment is inaccurate. It is true that there is an error in the "Functional - Load" BHAV @ line 5, but you have misunderstood the other BHAV/Node references. Each "error" you mention is actually the point in the code where a BHAV calls another BHAV; for example, the "Functional - Init" BHAV, at node 4, calls the "Functional - Load" BHAV (if you examine the "Functional - Init" from the JobDataGlobals you will see, at line 4: [semi 0x206E] Functional - Load (no args); this means that Init is calling the Load). Skiingiggy - The culprit is a custom career, originally cloned from the base-game "Business" adult career, and never modified to be EP-compatible. 1) The Object Data has name "JobData - Adult - Business"
Once found the (one or more) malfunctioning careers, you can make them EP-compatible by yourself, or ask the creator to update them (or anyway, post on the original thread where those careers can be downloaded, to alert the creators that the careers don't work if an EP is installed). I do have one career that never appears. Does that mean that tjis is the career causing the problem? I will remove the career first and post back. Evry other career i have is compatible, so i'll try, and if that dosn't work i'll check all of my careers to be sure. Thanks a lot numenor and KMN! I normally lurk, but this is really annoying me and I'm desperate for some help. Since I have the problem of the pet sinking into the floor, I followed the steps in this thread. The cat in question disappears entirely after you put in the boolprop line, and I have to reload the game and not put it in for the cat to reappear - however, it's still under the floor when I do. 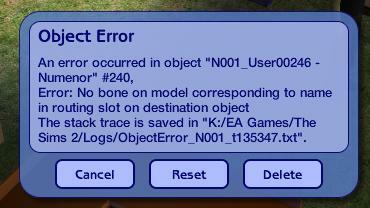 From the error logs I get when I DO enable, the problem item seems to be the default maxis feeding bowl, and I'm at a loss as to what to try next? It's helpful if you post the log with the question, because then we can look for something that might be conflicting - it's not necessarily the most obvious item which is causing the problem. Hmm, I had been having the Teleporting Cat problem for a while, too. At first I thought it was just random, but when my cat couldn't goto bed in it's own bed, or the couch, and instead chose to sleep on the floor, I figured something was wrong. After reading a few above posts, I found that of my custom content, the Risky Woohoo was the one causing the issue. Suspecting this, I went ahead and isolated it, running the game. Luckily, I had saved the game when my cat was moments away from jumping onto the counter. After removing RiskyWooHoo, the cat sat there perfectly fine. When I put Risky WooHoo back in, and replayed that same scene, the game broke at that point, droppin the cat back into the floor. I'll go see if the Risky Woohoo thread might have some info... It's livable to not have it, but it did add a sense of realism. Edit: Don't forget to always make sure you have the most up-to-date versions of your custom content! Because something as simple as having an outdated version of a hack can make everything not work! THANK YOU Numenor. My dogs are always sinking into the ground, and when I checked it said the Mr. Bearlybutts chair was the probelm. You said to check the less obvious things, and sure enough I had an incompatible recolor. The thing is, it was downloaded as a set, and none of the other recolors are giving me problems. Do you know how I could delete just htat one recolor? It's not clear whether the "set" you have downloaded consist of a single package containing all the recolours, or a group of packages. If the latter, you can either recognize the faulty recolour package in the Downloads by its name; or you can start the game, open the catalog and delete the recolour from within the catalog itself. If you can't see the "delete" icon in the catalog, then you should pick the Design Tool, click on the chair as if you wanted to change its colour, and then remove the faulty recolour from the recolour list. However, it's very unlike that a recolour can cause a game error: faulty recolours usually just flash in blue, or show white textures with a red cross on it. Are you 100% sure that it's that recolour to blame? I had a problem with endless lot loading. I did as it says to do above, and attached is the zip with the problem log. If I'm reading it correctly at all, it suggests that a job is the problem, and not an object. The confusing thing about that is I've not edited any jobs - at all. Only downloaded 4 objects and a house (lot). Could one of those things still have made this error? If so, any suggestions on a fix? Tornado, you've read the error log correctly; I see that in your lot there are TWO different "JobData - Adult - Athletics", and therefore you must have a custom career in your downloads. Look carefully into your Downloads folder, and you will eventually find the problematic custom career. #25 26th Jul 2007 at 12:14 AM Last edited by ang41187 : 5th Aug 2007 at 8:47 PM. I was wondering if someone could take a look at this error log for me & see if they might know what's wrong. My cats (and probably dogs too if I had them) keep sinking into the floor & I have no clue why. All I know is I've got like 50-100 of the same messages, just different animals. I sent one of each log (there's 3 total in the zip file) If someone could help me that'd be awesome! EDIT: I see that someone has downloaded my log, but I've gotten no reply. Please, if someone knows what's wrong, please tell me. The whole pets sinking into the floor thing & constantly getting error messages is getting very annoying & making it almost impossible to play my game.